← We’re not like the others. We’re your friends. The first thing I notice in the second episode is symmetry. Gant’s body is in the center. The camera moves, but mostly maintains an imperfect bilateral symmetry. The imperfections and imbalances are important, because otherwise the composition would appear obvious and artificial, and lose its impact. 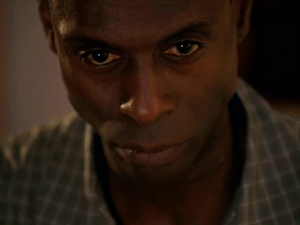 The episode closes with a symmetrical composition as well, with Daniels’ face in the center of the screen. That mirroring of the opening and closing compositions is a kind of symmetry too. Coincidentally, I was reading about symmetrical composition in the film journal p.o.v.. The article points out the obvious, that symmetry gives a certain power and importance to scenes and characters, but also says that symmetry is associated with scenes of death, which I did not know. Perhaps that’s why it was used in the morgue. We’ve seen a few shots, like this one, that come from surveillance cameras. You can tell because they’re in black and white. I find this slightly jarring, and not up to the level of subtlety at work in the series. Maybe it’s supposed to highlight the outdated technology. We also see color at work in Bubbles’ hat trick. 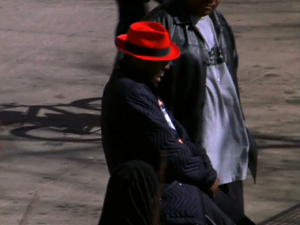 The red hat jumps out of the shots, acting like a spotlight on whoever he puts it on. Usually the use of color is more subtle. 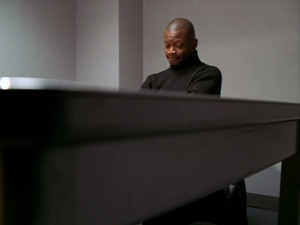 In the interrogation scene with D’Angelo, everything has a muted, neutral tone, mostly grays plus some skin tones. A few accents of yellow show up – the chair, and I think there’s a post-it in there somewhere – which telegraph the yellow legal pad. And that pad is what the scene is all about: getting him to write something. The scene in Perlman’s office shows cramped space, piles of boxes and files and papers. It’s a portrait of overwork. 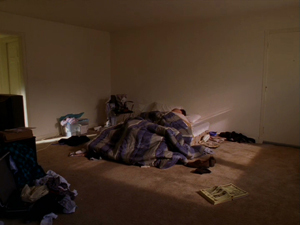 There’s a short scene in McNulty’s apartment. The place is practically empty. 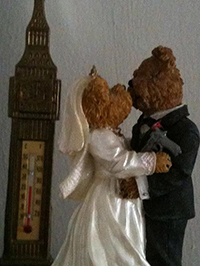 There’s a narrative reason for that – he’s separated from his wife – but it also says something about his character. There’s nothing in his life but the job. 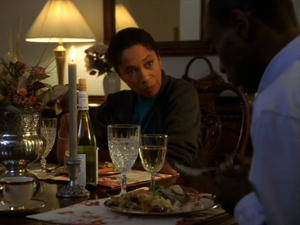 Shortly afterward there’s a scene of dinner at the Daniels’ house, which is a stark contrast to McNulty’s place. 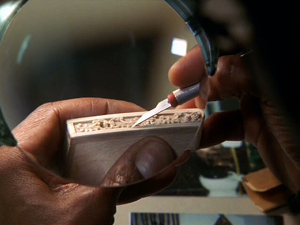 I like this shot of Freamon at work on his doll house toys. It shows a close attention to fine details. That says a lot about his character, which becomes more apparent as the series goes on. Here’s another picture of surveillance. As we said before, it’s a constant theme in The Wire, but what this shot shows is that the camera is on but no one’s paying attention – the person is doing a crossword puzzle. A series of shots tells a story too. 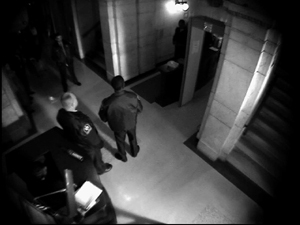 This is just a little scene with no particular significance, but it shows us the nice marble hallway in the police building, then the dark stairwell going down into the basement, then the dark, dungeon-like cellar hall leading to the room where the squad works. It tells us volumes about their status in the department. This entry was posted in Uncategorized and tagged ds016, wire106, wire160. Bookmark the permalink.